The cloud. A guide to cloud computing in its second decade. Cloud computing definitions, cloud services (SaaS, PaaS, IaaS), cloud delivery models (public cloud, private cloud, hybrid cloud and community cloud), cloud benefits, cloud myths, cloud adoption, cloud strategies and cloud evolutions explained with market forecasts and a look at fog computing. Cloud computing, also called the cloud, is a key given in many current and future evolutions. The cloud plays an essential role in the technological stack which enables digital transformation and is even the main delivery model in digital transformation projects. Cloud computing is also one of the essential enablers of Industry 4.0, has been shaping the software and business applications market for over a decade and has an important place in the development of the Internet of Things or IoT, to give just a few examples. In fact, a lot of the technological enablers, innovations and ‘disruptive’ newcomers in areas such as Fintech (financial technology) and the sharing economy, which we have seen popping up in recent years, simply aren’t possible without the cloud. However, cloud computing and the various strategic, deployment, technological and business aspects of the cloud are less known than is sometimes assumed. Despite being really around and being adopted increasingly across various cloud service delivery models since give or take 2005-2006, the reality of cloud on the service provider customer side often looks different and questions remain as we are well in the second decade of cloud computing. In fact, in some countries and in many types of organizations, cloud, especially the public variant, is only becoming a reality now as you’ll read. Cloud computing definitions: what is cloud computing and what is ‘the cloud’? When you work for cloud companies on the vendor and service provider side it’s easy to overlook that cloud is far from an ubiquitous given across all regions, types of companies and application areas. Having worked for several of those cloud service providers and vendors of specific cloud solutions in spaces such as CRM and security since the early days of cloud computing we saw how the narrative around the cloud changed from selling cloud and its benefits ‘as such’ to a focus on what cloud computing can do for organizations in practice. Admittedly we didn’t follow the evolutions in on-premises and data centers that much but a few words on on-premises architectures and cloud further in this primer. We also saw the increasing importance of hybrid cloud strategies for multi-cloud realities in larger organizations and an increasing attention for cloud strategy overall, although only a very small percentage of companies has a really optimized cloud strategy. So, while some companies have a hybrid cloud approach in place and orchestrate multiple clouds in this increasingy multi-cloud environment, for others the true discovery and deployment stage of cloud is only just beginning now. As you’ll read moving to the cloud is certainly not always the consequence of a planned strategy. In more than one case the move towards cloud delivery models and services occurs as a ‘natural evolution’. Yet, for companies that want to have scaled and scalable digital business transformation initiatives, the cloud is simply key and a key pillar, if not the key pillar and enabler of both the digital transformation technology stack you might have heard about (the third platform and its innovation accelerators ; the SMAC stack of social, mobile, analytics and cloud) and what they need in order to succeed. Obviously, the different speeds at which cloud adoption moves depends on multiple factors: type of activities, size of the organization, types of applications, geography, type of cloud and more. What we are seeing and what is also confirmed by many research firms as you can read further is that the end of cloud’s first decade and the start of its second decade is a tipping point whereby we move from testing the waters (with the many exceptions of more mature companies) to a larger scale business-driven and more strategic approach of leveraging the possibilities of the cloud in a clear vision of moving towards digital business. In some big organizations which jumped on the cloud bandwagon first that also means moving so-called workloads back from the cloud into the on-premises environment as we’ll cover, even if spending on ‘the cloud’ is poised to accelerate in many areas. When talking with ICT services providers and CIOs in 2017 about the understanding and adoption of the cloud we saw that cloud computing and many essential cloud evolutions are indeed not always that well known in a lot of organizations. A clear cloud strategy or an optimization of that strategy is even more rare. Moreover, there is an interesting and seemingly contradictory evolution happening. An overview. In some regions and organizations it’s only since Microsoft’s push for Office 365 that many companies take their first or more elaborated steps towards the (public) cloud or a somewhat strategic cloud approach. Several CIOs mentioned it as a trigger for public cloud adoption in interviews so it seems that Office 365 has shifted the mentality in some markets where companies have been rather reluctant in that regard and now (public) cloud adoption all of the sudden seems to be at the top of the agenda. This evolution isn’t that surprising though. As someone from Cisco Belgium told us back in 2014: “when cloud applications like Microsoft Office 365 become mainstream, the acceptance of the public cloud will grow as customers will see that, in the end, the public cloud is not that exciting”. In countries like Belgium and even the more mature market of The Netherlands that acceptance of public cloud is indeed happening. Globally, however, adoption of public cloud is growing faster than ever (with some caveats). It’s certainly not just about these countries nor about the Office 365 push or anything else of course (more below). Yet, it’s clear that with the usage of platforms such as Office 365, quickly other needs concerning these applications in the cloud appear such as the need for backup or data security. Regardless of the company-specific or country-specific drivers, along with other phenomena such as digital business, the replacement of legacy equipment, the changing demands from IT and the mentioned more mature approach towards cloud, it is certainly a factor that contributes to the higher growth in many cloud segments, including public, which we see in 2017 and beyond. Yet, digital transformation strategies and efforts remain key drivers in times when cloud demand is driven by business, innovation and flexibility goals, along with demands of various types of stakeholders and users. Cloud is simply needed for major transformation efforts. The scenario whereby applications such as Office 365 trigger (public) cloud adoption is one example where ‘going cloud’ can be a rather natural evolution. and many other potential scenarios. For other companies the decision to move towards cloud is a clear choice and even strategic mandate instead of a consequence of external and internal factors. It’s probably not a coincidence that the several CIOs we interviewed who clearly opted to move to the cloud in a systematic way all were active in very innovative companies where digital transformation and innovation as such didn’t just rank high on the agenda but was in the DNA of the company’s core activities in changing and innovation-driven markets. A strategic choice to implement more cloud solutions and services is not the same as a cloud strategy. With a cloud strategy we mean a strategy to optimize the multi-cloud reality of many of today’s organizations (the end-to-end view, management capacity and workload strategy, among others). While the first (strategical decision to move towards cloud) is usually tied to an increasing focus on the business, on agility and on innovation, in which IT is asked to play a key role, the second (a cloud strategy in the optimization of various clouds sense) is the really rare part we’ve mentioned. Do note that when organizations move to the cloud in an area as part of rather natural evolutions as we saw previously, IT (and other departments who are increasingly buying IT solutions and services for their goals, when done well) obviously in most cases has a strategy to do so. In any cloud implementation it’s best that IT and the business work together as still is not always the case in general. Moving to cloud as such is a journey and that does require a strategy. This brings us to the seemingly contradictory evolutions we’ve mentioned in the title of this chapter. While some organizations only now start bringing workloads to the cloud and start testing the waters as was typical in cloud’s first decade and others are moving to the cloud organically or as a strategic choice, in more advanced markets and companies where cloud has been actively used for several years, we see another, previously mentioned phenomenon: some are decreasing their usage of the cloud and taking specific workloads, applications or services and infrastructural components back in house. This isn’t a sign of a re-centralization, the forecasts for the growing adoption of and investments in various cloud delivery models and cloud services are still high. It’s a phenomenon that is caused by many reasons of which increasing cloud maturity is one. Organizations with the necessary cloud experience simply have a more workload-centric and business-oriented approach, looking at the best ways to handle various workloads. So, dealing smarter with workloads in a so-called hybrid cloud approach is partially a sign of a more mature cloud strategy. However, it partially is certainly also a token of some issues and/or disappointments with regards to the cloud or, better, with regards to some cloud myths. By presenting the cloud as one big thing with common benefits, without looking deeper, the latter shouldn’t come as a surprise. The cloud covers many realities and generic statements such as “cloud computing is cheaper” and several others have led to quite some cloud myths as we mention below. As usual it all depends and although lower costs in on-demand models and a move from CapEx to OpEx are certainly often mentioned and very traditional benefits, using the cloud does not necessarily mean that you’re cheaper off. It is not the only myth and the unexpectedly high costs in some areas certainly also lead to companies taking some workloads back in house. For organizations which are now testing the waters or get in a full ‘move to cloud’ mode as part of a choice for growing cloud adoption due to any of the organic or strategic mentioned reasons, it might be good to look at how more mature organizations are rethinking their cloud and workload approach. It’s the benefit of the later movers: they can learn from first movers, keeping in mind that each business and context is different. So what we see here is a global market with various types of organizations moving at very different speeds: some are really starting and see that in other markets others are slowing down or even reducing cloud deployments. That seemed like another good reason to look at cloud computing guide, among others separating myths from realities and explaining evolutions and most of all the ‘why’ behind them. A last reason for this cloud computing for organizations overview is that the term cloud has become so much used that it seems like this big concept whereby people are distracted from the reality of what the cloud is. And it is not a thing, it’s a mix of many things, services and realities whereby, as we’ll see there is clear shift in the perceptions of cloud advantages and benefits. After this look at some cloud market and adoption trends time to start with the essence of cloud computing and some cloud computing definitions. A simple explanation of cloud computing is that cloud computing is a collection of IT and computing services whereby an organization pays for the IT and computing capability as a service, the on-demand part. That’s the perspective of the organization. You don’t buy a cloud, you subscribe to a service. With cloud computing scalable and flexible IT-related capabilities are provided as a service to external customers using Internet technologies. Cloud computing offers private or public services over the Internet or via a private connection, and users access resources, software and applications through a web browser rather than hosting software locally within their own organisation. Don’t see the cloud as a single thing, but as a wide-ranging technology and business trend that changes how we look at things, particularly how organizations manage, pay for, design, operate, control and secure their IT. A long time ago the National Institute of Standards and Technology or NIST (more about these definitions and NIST in the next section and at the bottom of this page) defined cloud computing as follows: “Cloud computing is a model for enabling ubiquitous, convenient, on-demand network access to a shared pool of configurable computing resources (e.g., networks, servers, storage, applications, and services) that can be rapidly provisioned and released with minimal management effort or service provider interaction”. IT-related capabilities. These translate in computing resources to handle the workloads. Simply put, workloads describe the several independent tasks, services and requests of (different parts of) applications and IT systems which require computing resources including code processing. Many of these workloads, whether they are parts of services or full applications, can be moved to the cloud and back. It’s all a bit more complex but you get the picture. For now, the IT-related capabilities matter most. As a service. This is probably the main and best known aspect of the cloud, regardless of cloud delivery or cloud deployment model (the various types of cloud which we’ll cover) and the sorts of cloud service, ranging from infrastructural to applications. This ‘as-a-service’ aspect comes back in virtually all names of various sorts of cloud usage types and fits in a broader perspective that goes beyond the cloud and is a shift in the way we use technologies and even lead us to an as-a-service platform economy. Some people often use the somewhat older term ‘on demand’ in the ‘as-a-service’ context. The Internet. That doesn’t need too much explanation. The cloud is rooted in many technologies and evolutions, from very old ones such as distributed communications, grid computing and client-server to newer ones such as the Internet and its predecessors and enabling protocols, the virtualization of hardware and network resources, the ASP (Application Service Provider) model (using software as an off-premise subscription service via the Internet instead of installing it locally with potentially many licenses and a lot of maintenance and resources) and much, really much, more. Yet, the Internet is clearly the essence and you need it to access and manage your cloud services to begin with. Under the hood of cloud computing sits the capability of on-demand Internet and/or network access to pooled or shared computing resources and an infrastructure which consists of several components including databases, virtual machines, servers and connectivity and is typically invisible for the buyer of the services which they enable. The cloud is a popular name for this ‘cloaked’ pool of resources, which can reside in several locations and use various servers and other components, whereby the various services are delivered as one to the customer. Throughout this cloud computing primer we will mainly continue to refer to the well-known (other) cloud definitions of NIST (the National Institute of Standards and Technology) that exist since a long time. Although ‘the cloud’ has been evolving a lot since then and not everyone agrees with the definitions, it’s still an often used resource. Here and there we’ll add other definitions and, obviously, we look beyond cloud definitions at the realities of cloud. The NIST document defined the major cloud deployment models which we’ll cover further: private cloud, public cloud and hybrid cloud. Attentive readers might have noted that we forgot one: community cloud. That’s not because it doesn’t exist or isn’t important, well on the contrary; there are several community clouds but we won’t cover them in depth in this cloud overview. On top of these 5 essential characteristics some ‘common characteristics’ were added by early-day cloud pioneers. Depending on the privacy degree of the resources and service delivery mechanisms, several types of cloud deployment or cloud deployment models have been defined. There isn’t a cloud deployment model that covers all needs. Moreover, attitudes with regards to cloud deployment models have been changing over time as you’ll see next. The cloud delivery and cloud deployment models usually are divided into four main types We dive deeper in three of them further in this cloud computing primer. hybrid cloud (the answer to the multi-cloud reality of most organizations and de facto the main delivery model and strategic model). community cloud (not elaborated upon in this guide; simply a cloud that is used by a community of people for a common shared purpose and/or with shared/common profiles; an example: the BT Radianz cloud for the company’s financial customers). Within the category of private cloud often more distinctions are made. Other cloud delivery model related terms you might encounter for instance include virtual clouds, cloud of clouds and the inter-cloud model. More organizations move a broader range of workloads across critical areas to the public cloud. This, among others, has to do with the changed mandate of IT, digital transformation (and moving away from legacy IT) and a changing attitude towards cloud computing in general. The growth of public cloud is remarkable, also in mission-critical workloads, beyond more traditional applications such as public cloud storage. Yet, as mentioned, some companies are pulling some workloads back from the public cloud to some form of private cloud. The latter, along with on-premises non-cloud, is also still often used for highly sensitive data and platforms, for instance in banking or other industries where companies like to keep their data as close as possible and/or are forced to do so because of regulatory reasons. In reality many companies use several cloud deployment models for various cloud services and processes at the same time. And here we look at the cloud in the broadest possible sense, including CRM applications, the Software as a Service (SaaS) applications that your workers use (whether you know it or not) and so forth. As more IT buying decisions are taken by the business, certainly in SaaS, IT doesn’t always have a clear view of what it is used where, certainly when you start including SaaS solutions that are used on a departmental or individual level. With regulations such as the GDPR (EU General Data Protection Regulation), to name an important and fear-reaching example, one can’t afford this anymore and needs a clear view – and strategy in a de facto increasingly multi-cloud reality. This multi-cloud reality will continue to grow as there are simply different needs across the organization and not all workloads are the same. With the emergence of hybrid and more complex cloud environments, there was – and still is – an increasing need to have end-to-end cloud visibility and management for organizations. Concerns with regards to governance concerning multiple cloud management also enhanced the use of cloud brokers and ecosystems with a focus on multi-cloud, data center and network orchestration, ultimately resulting in cloud of clouds (cloud service integration) and inter-cloud vendor approaches. The consequence of the increasing leverage of the benefits of various cloud services and cloud deployment models is a further distribution of data and applications and inevitably comes with security challenges, still one of the main concerns with regards to cloud computing in general. Having a clear view of the risks and of course the multiple clouds in place, the essence of the need for a hybrid cloud approach as the way to deal with this multi-cloud complexity. Below we tackle some of these topics more in depth and when we dive deeper in cloud delivery models. Depending of the types of services and resources the customer subscribes to, various types of cloud services have been defined. The classic main ones are Software as a Service (SaaS), Platform as a service (PaaS) and Infrastructure-as-a-service (IaaS). SaaS always was the largest one, also from a spending perspective and also the best known one with CRM as one of the earliest software applications to move to a SaaS model. While in 2005, SaaS accounted for 8 percent of CRM, in 2006 it already went over 20 percent; today many younger workers can’t probably even name a non-cloud CRM application. The birth of Salesforce.com in 1999 certainly played a big role in the increasing popularity of the Software-as-a-Service approach. While SaaS still by far is good for the largest portion of public cloud spending its growth is slowing down while, in public cloud, spending in respectively IaaS and PaaS are growing most. SaaS: The capacity of running software applications in the cloud and de facto also used for (vendors of) applications in the cloud and sourced from the cloud as a service with a gradual increase of less typical applications than in the earlier days (CRM and ERM still account for the majority of spending though, with other early stage Saas applications such as web servers, collaborative applications, email and social apps to name a few) and increasingly including more mission-critical applications. PaaS: The cloud application platform, giving its user the capabilities to do virtually everything related to applications: from application development and testing to application management and beyond. You could call PaaS the cloud service model for developers of software, web applications and so forth. IaaS: Anything related to sourcing infrastructure-related resources and the hardware and other infrastructure as well as key infrastructural resources with regards to for instance computing power and connectivity. The hardware is typically managed and ranges from servers and storage to anything you find in a data center (and cloud data centers as such). Operating systems and several infrastructure-driven resources such as bandwidth also fall under the IaaS cloud service model. Infrastructure, the scalable way you need it. However, there are far more types of services and resources that can be obtained via cloud computing: from disaster recovery and back-up to computing capacity, bandwidth and security, everything indeed ‘as-as-service’. Among the more traditional cloud solutions we find Desktop as a Service, Backup as a Service, Business Process as a Service and Disaster Recovery as a Service; among the newer ones (although new is relative) we find, for example Security as a Service (and, indeed security offered IN the cloud), IoT Data as a Service and many more. Keeping in mind that there are various types of cloud deployments and applications, there are some similarities which are typically seen as benefits – of the cloud. 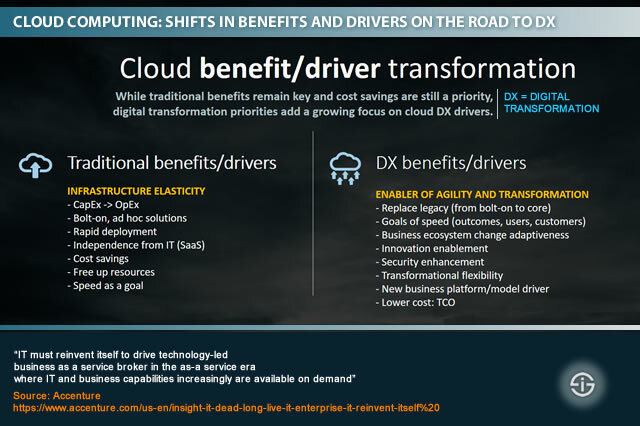 However, as shown in the illustration below, with some thoughts from Accenture, there are shifts in thinking about cloud benefits in a DX (digital transformation) context. These aren’t universal either. As said, while many companies ‘use more cloud’, others are taking some applications and workloads out of the cloud again. Others increasingly go for a cloud-first and even a cloud-only approach. Lastly, several cloud myths exist so it’s important to separate fact from myth when looking at cloud advantages. Before zooming in on some cloud computing advantages let’s take a look at the shift in benefits as illustrated. The flexibility of the OpEx model of cloud as compared to the classic IT CapEx model: operational expenditure versus capital expenditure – you know what you pay as a service in an operational context and up-front investments decline. The application of the cloud for bolt on and ad hoc solutions, a traditional approach in cloud’s first decade which often comes without an end-to-end view and management as a result. Better is to have a strategic journey view. The traditional benefits of infrastructure elasticity, rapid deployment, rapid development and so on. Speed as such can be added here. In an increasingly real-time economy and with users and customers that want to be served faster and want rapid applications, speed is key. Moreover, speed has become a potential differentiator and even necessity for survival in highly interconnected processes and supply chains. A higher degree of independence from IT in a world of shadow IT and where IT buying decisions shift to the business. This benefit is relative as IT always should be involved, even if it’s just because of the security and data protection perspective and an end-to-end approach that makes sure everything works optimally. In more than one case deployments and projects, also in digital transformation, fail or are slowed down because IT wasn’t involved (early) enough. Cost savings, a traditional benefit but in several cases also a myth as explained; cloud does not always equal cost savings. How do you know when it does? By calculating ROI and taking all aspects into account. Software applications are among the most typical candidates for cost savings. Cloud benefits and drivers which are becoming more important and are more important in a context of digital business, transformation and innovation. Essentially the business and transformation drivers are more important while there is a more holistic and end-to-end view in which goals and outcomes matter most, for the organization and its several ecosystem stakeholders, from staff and clients to partners. Speed as a goal as such becomes the relevance and role of speed in any given context of users, customer needs, partnerships and innovation. Innovation enablement and transformational flexibility as such are sought benefits and are among the reasons why, despite cost always is a consideration, the overall picture matters more in which the gains of innovation and transformation are added on top of the sheer cost aspect and in more than one case even lead to cloud deployments that as such are more expensive than non-cloud ones but there is no ‘as such’ as technologies always serve goals and should be seen in that context. Cloud is a key driver of these new business models and platforms that are typically wanted in more mature digital transformation strategies and that include several other technologies which also need cloud and/or have an impact on its usage. The Internet of Things for instance is a driver of cloud adoption and so is big data. The replacement of legacy IT, finally is also important in a context of moving from bolt-on to core business where IT increasingly sits and legacy IT replacement is one of the other drivers of (public) cloud spending increases. Let’s now zoom in on a few of the mentioned cloud benefits – and some cloud myths. Elasticity originally referred to technological elements in cloud computing and later mainly to infrastructure elasticity and elasticity as a synonym for flexibility, resilience and even agility in a business and user perspective. Simply said, elasticity referred to the possibility to scale up or scale down the IT capabilities customers get delivered via the cloud, in correlation with changes in demand which can occur due to several reasons. This dimension of flexibility and ability to stretch cloud capabilities or do the exact opposite rapidly when needed is still seen as one of the main traditional benefits. The shift in thinking is more one from infrastructure elasticity to elasticity as an enabler of agility, transformation and thus business elasticity, something everyone knows. While it might seem obvious that it’s the elasticity, agility and ability to act swiftly is predominantly a business given, it took quite some time until elasticity was seen from this perspective. It’s important to remind that in the early years of the increasing attention for cloud computing cloud service providers were mainly selling the benefits of cloud computing and responding to the concerns organizations had regarding the cloud. They believed that, in order to sell, they needed to sell the cloud as such. This is exactly the same phenomenon we saw in the early days of the Internet where all sorts of providers (solutions, services, connectivity etc.) were trying to convince consumers and businesses about the benefits of the Internet. It might seem hard to imagine now but that’s how it was. Today many companies are still selling the benefits of the cloud but since 2013-2014 the narrative finally changed and more companies looked at what the cloud could do for actual business needs and benefits instead of the far too generalist benefits of cloud computing. A 2014 article by Forrester analyst Craig Le Clair on the importance of business elasticity instead of infrastructure elasticity for some earlier movers was obvious in that regard but for many it was (and often still is) new. Quoting: “The infrastructure elasticity should be seen as an enabler for other dimensions that make the business more agile and higher performing”. A last comment on this aspect of a changing view on elasticity: the cloud does not live in isolation from others technologies which add to the agility and performance of a business of course. And it was good to realize and remind that as well. As mentioned previously, one of the most often mentioned benefits and at the same time one of the most common myths about cloud computing is that it is (always) “cheaper”. There are several instances and situations, again depending on context, when it is not. The ‘cheaper’ and cost saving premise is indeed attractive and goes back before the term cloud computing was used: distributed computing and using shared resources already was often mentioned in a cost saving perspective. Yet, we can see it mainly in a cloud computing software perspective and the promises of SaaS. At the end of the nineties the Internet gave birth to the so-called Application Service Providers (ASP) model which in many regards can be seen as a predecessor of this first booming and most successful type of cloud computing: SaaS or Software as a Service, simply said the use of software via a cloud-enabled subscription model. The ASP model, which was often graphically represented using clouds that essentially depicted the Internet, as said, was among others popular in CRM and marketing software and as it simply enabled to use software via the Internet it brought savings on the level of license costs, enabled smaller and medium business to start using otherwise for them far too expensive software, simplified software distribution to the various users (just a connection needed), always gave access to the latest version and made business users less dependent from IT. Moreover, the job of the ASP was to make sure the software was available and customers were serviced, with SLAs. There were different types of ASP models and some of them led to SaaS. The notion of cost savings was introduced for all the obvious mentioned reasons. Cost savings lived on when the cloud became popular and especially the move from a capital expenditure (CapEx) to an operational expenditure (OpEx) model for customers was a key aspect in selling the benefits of the cloud. No (high) up-front investments needed and sourcing services and resources via an on-demand model whereby many IT services became operational expenditures instead of capital investments. While this CapEx to OpEx shift was and is important and cloud computing very often leads to cost savings, certainly in SaaS, cost savings aren’t certainly always the case and selling the ‘cheaper’ factor as a universal cloud benefit essentially is a myth that all too often keeps being told (strictly speaking there is also no link between OpEx and cheaper of course). Cloud computing in most cases does lead to a lower Total Cost of Ownership and OpEx offers many benefits. Yet, just as the thinking regarding elasticity shifted to the business outcomes perspective, organizations with a strategic approach look at the overall business case and the goals they want to reach with the cloud and these goals and additional benefits do lead to situations whereby a cloud approach makes more sense, despite not saving costs or even being more expensive than previous approaches and legacy systems. One has to think far broader and also include the effects of goals such as better customer service, enhanced worker productivity, innovation and transformation capability, the reallocation of internal resources (including IT staff) to be less busy with the IT stuff and focus more on the business side of things and many other elements we touched upon previously. As mentioned, one of the key reasons why the ASP model became so popular in specific domains was the independence of IT in a software context. While today IT doesn’t have to come with an application that is hard to use – because no one will use it – there was indeed a time that the independence from IT was perceived as an amazing blessing. The sheer possibility to use CRM applications as a business person without having to call in an IT person was a revolution. The independence from IT is still often mentioned as a benefit of cloud computing. Yet, here as well, there have been shifts and the roots of this independence are largely in the SaaS domain. In fact, it is even partially the essence of SaaS: we don’t want to know what is powering the application and all the infrastructure underneath it, we just want to use it. With on-demand self-service being an element in cloud computing the independence went even further than IT, certainly in consumer-grade applications. It stretched across the relationship with the service providers themselves: self-service. It didn’t take long before the popularity of myriad of cloud applications, in combination with other parts of the SMAC stack (think mobile or mobile ability) led to the BYOD (Bring Your Own Device) and later BYOx (Bring Your Own Anything, including apps) phenomenon, along with an increasing demand from business divisions to control the acquisition of the cloud applications they needed. The consumerization of IT was born and the IT buying decision power shifted to the business. However, here as well things have changed again. IT does play an important role in cloud deployments. With the advent of ever more multi-cloud environments IT has a role as an orchestrator as we covered here. Yet, at the same time there has been a shift from an ad hoc IT-independent cloud benefit view towards a more holistic IT approach, not in the last regarding security, governance and compliance and simply involving IT in business decisions that touch upon technological choices and digital transformation. It is a well-known fact that not involving IT in digital transformation slows down transformation. It also is a well-known fact that, in order to be successful one needs a cloud strategy. As IT becomes more important in the business and mission-critical services and systems are deployed in cloud environments, beyond SaaS, IT simply is key for these and many other reasons. In more than one sense the independence of IT shouldn’t be considered as a main cloud benefit anymore. If digital transformation is about one thing, it most certainly is about the end of silos and the collaborative striving towards holistic and inclusive approaches that don’t just enable ad hoc optimization or solutions but a cross-functional and profound staged approach. Last but not least the role of IT hasn’t just changed in the cloud, digitization and transformation perspective, it has changed overall. As Accenture put it a while back IT needs to reinvent itself to drive technology-led business as a service broker in the as-a-service era where IT and business capabilities increasingly are on demand. IT decision makers are challenged to find the best IT capacities, reliability, speed, availability, flexibility, infrastructure and solutions for their business. On top of the business needs in the strict sense they also need to take into account security, regulatory requirements, growing computing resource demands and the needs of users, including mobile workers, management, partners and changing end customers. Yet, how do they chose where which workloads, data, applications, infrastructure components and computing resources should be placed and/or sourced where? How do they decide for each single business demand if it’s best to stay on-premises, go for a private cloud infrastructure/solution, pick a public cloud approach or combine several methods in a hybrid way? In times where multi-cloud models gain speed and user/business demands evolve, a hybrid approach is often best as we’ll see. It’s often also where a partner with proven expertise comes in. A partner that enables organizations to focus on their business and user demands, knowing that, regardless of cloud deployment model or on-premises approach, they will have the best infrastructure for their needs and the best solutions for their uses. In this section we look deeper into these deployment models. Again, there is no such thing as an ideal architecture. Yet, there are relatively universal reasons why one or another approach might be best for specific needs. Before looking at the various circumstances in which specific type deployment models are generally more suited and presenting a few strategic cloud models let’s start by looking deeper at the differences between private cloud, public cloud and hybrid cloud from the perspective of organizations. Before doing so we need to take a look at some other terms that are often used in combination with cloud infrastructure but strictly speaking are not cloud (and exist since long before the cloud), yet remain important and are increasingly connected with cloud environments. On-premises architectures, infrastructures and resources strictly speaking have nothing to do with the cloud, even if there is a lot of virtualization going on here as well (virtualization doesn’t equal cloud) and in practice cloud, and at least connecting with it, is never far away. On-premises, as a term, refers to the physical location of software, platforms, hardware and infrastructure (communications, storage, backup and much more), ranging from servers and server rooms to on-premises data centers. On-premises means that it’s on-site, in your buildings. On-premises environments also need a high degree of availability and performance as drivers of business efficiency with the connectivity between on-premises and cloud environments as part of the ideal architecture for each individual organization. For many (smaller) organizations with limited IT needs on-premises still is often enough, even if de facto typically at least some form of cloud is used, whether it’s a cloud service such as CRM in a cloud software model or some form of cloud deployment model (with SaaS applications such as CRM or marketing suites de facto already being predominantly public cloud). Yet, we’re looking more at the infrastructure level here. One or two servers, a few clients (computers, thin clients), storage equipment, network services and all the systems and other hardware needed to run the business are all parts of an on-premises deployment, which again, can be enough – and can be complex. As a reminder, servers can be used for various tasks: web servers, mail servers, computing servers, database servers, file servers, the names of these and other examples say what their purpose is. Servers are both hardware and the software which is needed to perform these tasks and serve the clients in the good old client-server model. While such smaller organizations might also have applications on-premises they will typically, as mentioned, also use some SaaS applications, for instance for collaboration. An example of an application which you will still often find in a client-server model in larger organizations too is document capture software to scan and digitize documents (which can be a pretty huge operation in large companies such as banks where scanning is often still predominantly a centralized given). Typically, software in client-server models come with license costs (CapEx), upgrade costs and so on. Although servers can be found a bit everywhere in the building, they usually sit in computer or server rooms (now and then in small organizations they can look more like server shacks) which in several ways are or should be designed to make sure the servers, networks, date storage facilities, applications and so on perform best, aren’t accessible to everyone and are up and running the whole time. This design partially has to do with the room itself: where is it located, how hot/cold is the room, where are the walls (an exterior wall can cause higher humidity, etc.). Yet, most design elements have to do with equipment: power supply, backup systems, air conditioning and temperature control (HVAC), redundant network systems, you name it. A more professional server room with multiple servers, storage, network and other equipment which is larger and more professionally designed, equipped and protected is a data center. Although traditional, non-cloud, data centers still are used, workload distribution over traditional data centers has been strongly declining proportionally, compared to cloud data centers. On-site servers, server rooms and data centers, although important and certainly the latter a complex given, are not cloud. Yet, servers and data centers can be part of a cloud and data centers can be a private cloud or part of a public cloud (whereby public cloud providers and other cloud services providers typically use many many data centers). And in IaaS we indeed have cloud data centers. It’s about the difference between location and equipment on one hand and the cloud technologies on the other. Cloud is an additional layer of technologies that enables dynamic workload deployment through a higher degree of virtualization than in a traditional data center, leading to a virtual infrastructure (the mentioned shared resources) and enabling cloud services. In essence that’s what the cloud, certainly public cloud, is about for the customer: not having to care, let alone know, where the servers and all the other gear, sits, and being able to use all the capacity as a service with clear SLAs. Simply put, the cloud needs specific software and data centers but data centers are essentially facilities or ‘places’ and aren’t necessarily designed to support cloud. However, you can turn your on-premises data center into a private cloud. On top of on-premises server rooms and data centers, you can of course also use data centers of third parties, bringing us to housing or hosting (where we touch various private cloud deployment models, see further) but the evolutions in and possibilities of data centers are again another story and data centers are a world of their own. Non-cloud on-premises IT isn’t gone of course. There are still several pieces of IT and computing that don’t match any form of cloud delivery model or cloud service model and there are several applications, workloads and so on that, even if they could, shouldn’t go cloud if the case isn’t there. As said, it’s the end-to-end architecture and view that matters, connecting all sorts of clouds, on-premises and possibly externally housed resources and about optimizing that mix for the needs and requirements of the business and each workload. As long as it all does what it needs to, preferably in the best possible way, whereby best can mean many things, depending on the goals of the gear, the solutions and the workloads. Despite the fact that strictly speaking an on-premises data center is not a (private) cloud, the notion and reality of part of the private cloud delivery model in reality is often used for what we used to call centers – and hosting – not that long ago. And that brings us to private cloud. What is private cloud and what should you now about it? As the name indicates a private cloud is a specific cloud computing model that offers many computing resources as a service as we know them from the public cloud and from our cloud definitions with an important distinction: only the specific customer can use the – distinct – resource pool in this virtualized environment. There is a misconception that a private cloud is always an on-premise infrastructure which is owned and managed by the customer. But, as a Gartner paper put it years ago, it’s privacy, not location or ownership, that defines a private cloud. In other words: private cloud can be sourced as a fully managed service. There are indeed various flavors of private cloud, each with their benefits and disadvantages. These different flavors in fact are already present in the definition of private cloud according to the National Institute of Standards and Technology. NIST’s definition of private cloud: “The cloud infrastructure is provisioned for exclusive use by a single organization comprising multiple consumers (e.g., business units). It may be owned, managed, and operated by the organization, a third party, or some combination of them, and it may exist on or off premises”. As you can see various types and flavors of private cloud indeed as we’ll cover below. Private cloud typically was and often still is one of the first ways in which organizations test the cloud waters, often moving to a hybrid (private and public) or public cloud later. Yet, there are also several reasons why companies use a private cloud and often will keep doing so for various potential reasons as you’ll read next. What are the advantages and disadvantages of private cloud? It depends as usual: on the context and on the types of private cloud models. In general, with private cloud you have the speed-to-market and (to some extent and depending on configuration) scalability of the public cloud but with better security as Forrester’s Jennifer Adams put it in a blog post, end 2016. The most typical reasons why organizations want to use private clouds, which only they can access de facto indeed are security and control with related reasons such as data privacy, regulations and compliance. These are of course very important reasons, especially with regulations such as the GDPR and concerns regarding very sensitive data in mind. By way of an example: European organizations often worry that if their data is stored in the US by a public cloud provider, they could face regulatory problems. Private clouds also offer other benefits on top of the guarantee of certain service levels regarding security, privacy and regulatory compliance. Private cloud users, for example, can decide exactly where their data is stored, how it is secured, who has access to it and more. A private cloud can also offer other benefits of cloud such as a better allocation and efficient use of resources, increased reliability, resilience whereby virtual partitions take over when physical equipment fails (do note that virtualization as such does not equal cloud however) multi-tenancy and self-service, to name a few. Private cloud is also often used in the case of special and unpredictable computing needs, whereby a direct control might be needed. On the downside of a private cloud and thus private cloud disadvantages, heightened control and security are traded for a higher need of skills and all sorts of resources and many full public cloud benefits aren’t leveraged. An on-site private cloud typically requires extra stand-by-capacity to manage peaks in demand and brings along capital expenditure. A hosted private cloud, delivered as a fully managed service can offer a solution here. A private cloud typically also doesn’t offer, or at least lessens, key benefits of public cloud delivery models such as rapid elasticity, the consequences of resource sharing and full scalability. It’s not as if private clouds don’t offer scalability to some extent, yet that depends on the type of private cloud. Fully managed private clouds can help overcome some of the disadvantages of private cloud but not all. These and other disadvantages of the private cloud delivery model don’t mean that private cloud is going anywhere soon. As we’ll see in the section on hybrid cloud, organizations continue to have circumstance in which a private cloud is needed. In combination with the increasing usage of public cloud, it is one of the reason why hybrid cloud models dominate. In the earlier mentioned blog post of Forrester’s Jennifer Adams, she reminds us that despite the attention for the ‘hypergrowth’ of public cloud, the market of private cloud solutions is poised to grow at a compound annual growth rate of 11 percent until 2021. According to Jennifer the main drivers of private cloud adoption are, among others enhanced IT infrastructure manageability and flexibility, obviously along with the security, regulation and compliance reasons we mentioned before and which equally obviously appeal more (in general) to industries such as financial services (regulation) but also to companies who are not ready to make the move to public cloud as they still have security and privacy concerns, often when testing the waters. On a side note: we see that the far-reaching GDPR does have an impact of the use of private and public cloud. There will probably always be a piece that organizations will want to facilitate from within a private cloud or because it will not be possible to do so via the public cloud. There can be many reasons for such situations, necessitating a hybrid approach. Some applications or solutions could be too specialized or have other specific traits, for instance, from the mentioned security perspective. Simply said: a private cloud is the best option for a circumstance in which it makes most (business) sense and public cloud isn’t, for whatever possible reasons. Nothing less, nothing more. According to the previously mentioned blog post Forrester sees pre-integrated converged solutions and appliances or ‘cloud-in-a-box’ turnkey solutions which accelerate the journey to cloud as the fastest-growing sector with a CAGR until 2021. RightScale’s 2017 State of the Cloud shows how private cloud adoption flattens across the main platforms for private cloud (platforms offering the foundation, with several features and often additional modules that enable private clouds through virtualization, operations management, API’s, control planes, dashboards, monitoring, networking, storage, DevOps and other tools), with the exception of the Microsoft Azure Pack/stack for private clouds. Attention: although some of the mentioned products also enable building public clouds and although Microsoft Azure as such is public, this is not the same as the virtual private cloud model, which is covered next. In everything we said this far regarding private cloud, the various flavors of private cloud have become visible: on-premises, hosted,… Yet, there are more types of private cloud. In fact, there are so many different terms for different types of private cloud (often with the same or overlapping meanings) that one can become dizzy by trying to grasp the differences. An overview. Public cloud service providers offer private cloud in the form of VPC or virtual private cloud. As the term virtual already makes clear this means that they allocate a pool of cloud resources in a virtual, yet distinct and isolated way so you have a private cloud within a public cloud environment. Remember what we said earlier, pointing to Gartner: in private cloud it’s the privacy that matters, NOT the ownership or location. Virtual private cloud is a perfect illustration of this. In an internal private cloud and/or on-premises private cloud the aspect of privacy is joined by aspects of location and/or ownership. It uses the infrastructure and resources of the organization, on-premises or in a ‘housing’ mode (whereby everything is simply housed in someone else’s data center and a housed private cloud is enabled). What matters most in internal private cloud is the presence of the necessary cloud enabling technologies and software to enable a private cloud model, beyond simple virtualization. We can also bring in concepts such as corporate cloud here but in the end it all overlaps a bit and it would take us too far for an overview of cloud computing in which benefits, strategies and evolutions are more important. Hosted private clouds and fully managed private clouds are more often used and bring us further away from the location and ownership aspect again. They are also a bit further from public cloud than VPC as in VPC we use ‘part’ of a public cloud as mentioned. In hosting we use the infrastructure of a third party, the hosting provider, who owns the material and infrastructure (in contrast with housing). Hosting today almost by definition means cloud. In a fully managed private cloud there are often even more functions, tasks and built-in solutions in the on-demand model which can easily be activated or are de facto part of the managed private cloud. Others require additional subscriptions. With a more limited hosted cloud some of these managed services can be offered as services which need to be paid for as additional subscriptions separately. So, compare what types of services are available by default and which ones you could need additionally (with their costs and capabilities) or need in later stages. Private clouds – or at least parts of it – increasingly get outsourced. That’s the next step. But first organizations need to have it right and know what they do and don’t want to outsource. The next stage is then the move to the public cloud which we tackle next. When people speak about the cloud they usually mean the public cloud. Its adoption is growing fast and it is what you typically think about when mentioning Microsoft Azure, Amazon Web Services, Google Cloud Platform and IBM Cloud. It’s the ‘real’ cloud some would say. A few years ago we had a chat with Bruce Richardson (SalesForce.com) who said that hybrid clouds would prove to be a marketing gimmick and that real clouds are multi-tenant for optimal economics and management. While public cloud adoption is certainly increasing we’re not there yet. Moreover, as said, there are various reasons why organizations won’t simply put everything in the public cloud anytime soon and private clouds will continue to drive the hybrid cloud model. Referring again to NIST, public cloud is defined as follows: “The cloud infrastructure is provisioned for open use by the general public”. It’s here that all the advantages and characteristics of cloud computing come into play most. Despite the de facto dominance of the hybrid cloud delivery model in times when multi-cloud environments are on the rise, the increase of public cloud adoption, including for mission-critical applications, is key. When looking at some trends in cloud computing and the rapid growth of public cloud in 2016, 2017 and beyond Gartner’s Sid Nag pointed out how there is a shift away from legacy IT services (often standing in the way of digital transformation and the capacities needed to perform as a digital business in a DX economy) and that enterprises indeed move away from data center build-outs as they move their infrastructure to the public cloud”. This brings us back to the changing benefits and drivers in cloud computing which we mentioned earlier: from cost savings, freeing up resources and rapid deployment to the replacement of legacy, the cloud moving to the core of business in transformation, innovation enablement and so on. The benefits of public cloud are pretty much explained already throughout this cloud computing guide. Among them are the cloud benefits that often cannot be leveraged in a private cloud model as we saw them in the private cloud section: a higher degree of flexibility whereby you pay for the services and capacity you actually use and can scale up or scale down much faster, to give two examples. Also the public cloud business efficiency, enabled by its inherent resource sharing, is important. Of course there are disadvantages as well. These are also a mirror of the benefits and use cases of private cloud: for special demands and applications public cloud might be harder to use and customize or even not be possible at all. And then there are the aspects of, for instance, security and compliance, among the reasons indeed why organizations select private clouds in an increasingly hybrid cloud mix. Yet, many of the often mentioned disadvantages and risks of public cloud have proven to be wrong. As Forrester’s Paul Miller writes in his July 2017 announcement of a new Forrester Wave for the hosted private cloud market in Europe: “The arguments that public clouds cannot scale, are not secure, are not ‘enterprise-grade,’ and will never be allowed by regulators to host sensitive workloads are being dismantled one by one”. This doesn’t mean that private cloud will disappear in the near nor far future though. We mentioned some data on private cloud forecasts in that section and Paul’s blog post is meant to show that “here is still a role for various flavors of private cloud” and to promote a webinar about how hosted private clouds and on-premises private clouds evolve in these hybrid days. According to Forrester public cloud adoption is happening faster and will happen faster in coming years than the company previously had expected, due to increased demand for SaaS, IaaS and PaaS. The cloud application market (SaaS) would grow to a total of $155 billion by 2020, which is 17 percent higher than Forrester’s 2014 forecast. However, mainly cloud platform revenues (IaaS and PaaS) were showing accelerating growth which led the research firm to up its forecasts with a whopping 45 percent, in comparison with 2014 projections. The cloud platform revenues would thus reach $64 billion by 2020, in other words: moving far closer to half of the obviously dominating SaaS category than previously projected. As mentioned previously most organizations have some form of cloud nowadays and an increasing majority has a multi-cloud environment. And that brings us to hybrid cloud. There are quite some misconceptions about what hybrid cloud really is. Some people think it’s just the fact of using public and private clouds in an organization, what it is clearly not. The differences in perceptions of hybrid cloud and thus what exactly hybrid cloud means, let alone a definition of hybrid cloud, clearly show in the below image, based upon research you can find here. A majority (40 percent) defines hybrid cloud as the use of public and private cloud. 15 percent defines hybrid cloud as a cloud plus any additional cloud and non-cloud infrastructure. 12 percent goes for hybrid cloud as multiple applications portfolios across multiple deployment options. Let’s take a look at how the National Institute of Standards and Technology defined hybrid cloud: “The cloud infrastructure is a composition of two or more distinct cloud infrastructures (private, community, or public) that remain unique entities, but are bound together by standardized or proprietary technology that enables data and application portability (e.g., cloud bursting for load balancing between clouds)”. That binding aspect is crucial and is where hybrid cloud strategy and management come in; so it’s not “just” using several clouds. With regards to the business aspect of hybrid cloud, here is what a CIO told us on the role of hybrid cloud in a landscape where public cloud adoption is on the rise: “There will always be a hybrid cloud. ICT is at the core of business for many organizations and, depending on the context, they will always want to do some things themselves. On top of that there’s the legacy. Nevertheless, the acceptation of the public cloud goes faster”. It does indeed and replacing legacy systems happens to be one of the drivers. As flexibility, business agility, the possibility to deploy and to scale fast are increasingly joining and even overtaking more traditional cloud benefits such as cost saving as organizations focus on optimization, innovation and transformation in an increasingly real-time economy where speed and time-to-market are essential and customers and end users expect fast and available applications and experiences, this flexibility also goes for the ‘mix’ and management of various clouds.. IT is hybrid, business is hybrid, it all gets more complex with new technologies, evolutions and digital transformation requirements that in the end are about more holistic, flexible and, indeed, hybrid realities. The integration of IT and OT, multi-modal IT, different forms of doing business within ecosystems, changing demands at different speeds and various individual realities, you name it. It’s clear that in a world where we look at outcomes and optimized approaches to run the business and at the same time innovate, diversity and flexibility matters. And that goes for the cloud too. Again, there is no one-size-fits-all for every IT or computing aspect and each organization, application, process, project and workload is different. So, yes, companies predominantly go for hybrid cloud solutions in the current rapidly growing multi-cloud reality. They can move workloads from one type of cloud to another, upscale in no time, adapt their cloud needs in function of demand and dispose of a wide range of additional tools in the cloud to accelerate application roll-out at scale, add intelligence to their cloud environments, protect the endpoints of their business with smart cloud-based security tools and deploy new software faster, not just by ‘putting it in the cloud’ but increasingly by truly migrating it to the cloud computing paradigm. In the introduction and cloud computing definitions we briefly touched upon the main cloud service models: SaaS (Software as a Service), PaaS (Platform as a Service) and IaaS (Infrastructure as a Service). In this section we examine them more closely and also look a bit closer at some as-a-service solution which are typically found in cloud computing. Along with Software as a Service (SaaS) and Platform as a Service (PaaS), Infrastructure as a Service is one of the three key cloud service models in cloud computing as, among others, defined by NIST. Simply put, in IaaS the virtualized cloud computing resources are the (hosted) infrastructural components of your IT infrastructure, ranging from servers, storage and other hardware to infrastructural elements which are key in an IT infrastructure on levels such as network connectivity, operating systems, computing (processing) capacity (tied to the servers and server capacity) and bandwidth. Sometimes IaaS is predominantly used in a server context, at other occasions it is used for full virtual data centers or the overall enterprise IT infrastructure. IaaS is what you need to think about when hearing terms such as infrastructure clouds or elastic compute clouds. Very often people mention SaaS first when summing up the three main cloud service models but IaaS is far more interesting for many reasons. One of them: cloud system infrastructure services are growing fast, certainly in public cloud. While SaaS was the obvious first fastest growing cloud service model and is still dominant, growth of the cloud application market is slowing down, compared with IaaS and the smaller PaaS market. In some regions IaaS spending is even poised to surpass SaaS spending. According to IDC (press release July, 2017) this will, for instance, for the first time ever happen in 2017 in the public cloud services market in the APEJ region (Asia/Pacific without Japan). With digital transformation as the driver of multi-cloud and hybrid IT environments (cost-effectiveness, agility,…), IaaS is even used in highly regulated markets, says IDC’s Liew Siew Choon. This is mainly the case for workload trial runs and testing new services in these markets, such as finance. Another reason why IaaS is growing fast is related to risk management with a very important role of IaaS for data backup and disaster recovery, IDC states. On a worldwide level public cloud services spending on IaaS will grow much faster than SaaS with a five-year compound annual growth rate of 30 percent according to IDC July 2017 data, covering the period until 2021. This makes IaaS the highest grower of all three service models during the forecast period. NIST defines IaaS as follows: “The capability provided to the consumer is to provision processing, storage, networks, and other fundamental computing resources where the consumer is able to deploy and run arbitrary software, which can include operating systems and applications. The consumer does not manage or control the underlying cloud infrastructure but has control over operating systems, storage, and deployed applications; and possibly limited control of select networking components (e.g., host firewalls)”. Do note that IaaS is not solely a public cloud given. As mentioned in our cloud computing definitions section, the SaaS cloud services model is all about software applications and is the most common and best-known of all three main cloud services, with IaaS ranking second and PaaS third. SaaS is sometimes also referred to as application clouds or application and information clouds, which pretty much says it all. In the early days of SaaS typical applications to be used in a Software as a Service model included web servers and email platforms. The big boost came with the SaaS CRM (Customer Relationship Management) boom which, today, along with ERM (Enterprise Resource Management, as the name says software that enables managing resources, ranging from network resources to HR applications, manufacturing resources and more) account for the main portion of SaaS spending. Yet, also the typical applications which we saw becoming more important of the ‘social’ part of the SMAC stack (where the S stands for social), ranging from social business and social enterprise applications to (social) collaboration tools and the typical applications which are used in that part of social business, social media marketing and social media monitoring, are all delivered in a SaaS cloud services model. If you look at today’s overall customer relationship management and customer-facing applications environment, with a big role for the sales and marketing technology stacks, you’ll notice that SaaS de facto is the service model in many applications beyond CRM and including, among others, web and customer analytics platform, marketing automation tools, content marketing software, integrated marketing suites and so on. Although there is a slow-down in SaaS applications for all the obvious reasons, it goes without saying that the cloud applications and information market is poised to continue to grow. Where SaaS used to be mainly leveraged for less mission-critical applications in the early days, digital transformation leads to more core applications moving to a SaaS model. Many ‘more recent’ technological phenomena that are often key in digital transformation initiatives, ranging from big data, new AI-powered solutions and certainly the Internet of Things give birth to new cloud solutions. In IoT, for instance, there are the so-called IoT platforms, which are all cloud, and even a cloud for IoT data monetization for IoT vendors and service providers, to give a few examples. In our cloud computing definitions intro we called Platform-as-a-Service or PaaS the cloud for developers of various possible types of applications. That’s also why you might hear the term development clouds in the context of PaaS. Yet, application development should be seen in a rather broad context here. PaaS is used for many activities with regards to software, solutions and web application development. PaaS enables testing, environments, comes with runtime environments, enables application development as such, offers application management and configuration, etc. It is typically used by web developers, developers of software in general and by organizations who build their custom software applications and need a testing environment and/or an environment to offer it to internal users via some cloud delivery model. In the public cloud deployment model PaaS is the second fastest grower until 2021 from a spending perspective, after IaaS and before SaaS. Yet, in absolute terms it is the opposite: PaaS accounts for the smallest public cloud spend, IaaS is the second biggest or smallest if you prefer and SaaS is number one. NIST defines PaaS as follows: “(in PaaS), The capability provided to the consumer is to deploy onto the cloud infrastructure consumer-created or acquired applications created using programming languages, libraries, services, and tools supported by the provider. The journey to the cloud isn’t really a journey to the cloud but it is a journey. Let’s explain: no one buys a cloud and no one goes full cloud just like that (except for the many start-ups that exist and live thanks to the cloud). Migrations to cloud delivery models and cloud services happen in very different ways, according to company, coincidence, choice and myriad other contextual factors. Often somewhat smaller organizations where there is more overview take it step by step, starting with some private cloud and some less critical applications or sensitive data. Yet, at least as often many cloud initiatives happen at more or less the same time in different parts of the organization, organically or by design. And it’s often when organizations see that in fact there are several cloud services and even delivery models being used without a clear end-to-end overview that the strategic questions and hybrid reality truly kick in. By learning from other companies and better understanding the benefits, disadvantages of and types of scenarios which are better fit for cloud, a more strategic approach can be taken. And by that we mean a roadmap but most of all a sound analysis of the current IT infrastructure and operations, current and future needs and simply an evaluation of the value, performance and business requirements regarding any given part of the computing space and various workloads within it. According to CompTIA’s Trends in Cloud Computing 2016 study, over 90 percent of companies claim to use some form of cloud computing. And according to IDC, 68 percent of organizations had some form of cloud strategy (public or private) in 2015. Although both surveys are done by different parties using a form of cloud computing indeed doesn’t equal having ‘some’ form of cloud STRATEGY. Moreover, IDC found, the variety of workloads being moved to the cloud grows and at the time of the survey 30 percent or more of responding organization had moved or planned to move ‘literally every workload’ IDC had questioned companies about, to the cloud. The main challenge that remained: improving cloud strategies as more workloads and applications are moving organizations towards a cloud first environment. Also in 2015, Gartner and other research firms found that the type of services that are being moved to the cloud become more mission-critical, of course depending on the type of industry as in some industries there is a rationale to keep data as close to the core of the organization as possible. Yet, these exceptions aside, the evolution is clear, as is the growth of a variety of cloud services in the public cloud with mainly IaaS (Infrastructure as a Service), BPaaS (Business Process as a Service) and SaaS (Software as a Service) all growing, with a leading growth position for cloud system infrastructure services (IaaS). According to the earlier mentioned RightScale 2017 State of the Cloud research the expansion of public clouds which are in use and the movement of more workloads to cloud respectively rank third and second among the main cloud initiatives in 2017. The optimization of existing cloud use, mainly for cost savings, and thus a more strategic management of workloads, ranks first. Cloud is moving to the next stage. Forrester speaks about cloud’s second decade, for instance, when announcing a new report that looks at the ten key developments in cloud computing which will shape the industry in 2017. That next stage, expected to start in 2017 according to the report, that was released on November 2nd, 2016, is one of an accelerating cloud market. After having been one of the most disruptive forces in the past decade, as Forrester puts it, and having enabled transformations across the board, the company expects enterprises (large organizations) to move in much faster and embrace the cloud to power their core business systems, on top of the customer-facing applications (systems of engagement) that are already very ‘cloud first’. In other words: Forrester confirms Gartner’s findings that mission-critical and core business applications are going cloud – and faster than before. And that a strategy is not a luxury. And with the increase of multi-cloud realities, not forgetting the just mentioned growth in public cloud environments, that is a challenge for CIOs which is addressed by cloud services integrators. Obviously cloud doesn’t live in isolation and IT strategies require more but as the role of IT is changing in the business and as the role of the CIO is changing, so is their role in cloud computing. Simply put, cloud is shifting from an additional technology which is added on top of existing infrastructure towards becoming the core of several systems, including – and increasingly – mission-critical ones in the enterprise, enabling organizations to move at the faster pace they need, mixing public and private clouds. And that has an impact on the CIO and on IT spend. In July 2016, Gartner reported on the cloud shift, or how IT spending ‘is steadily shifting from traditional IT offerings to cloud services’. In the Gartner image below you can see how the shift from traditional IT spending to cloud has been and increasingly is happening. Companies who are serious about their journey to the cloud, mainly those who have made a strategic choice to go cloud in an innovation and transformation context as mentioned earlier, in many cases have a clear cloud roadmap: a plan to move from A to B, possibly with a partial detour via A2 or a bit of A3 here and there as roads are rarely straightforward or linear as we like to present them, it’s a complex and hybrid connected IT world indeed. There are many of such cloud roadmaps and most of them are designed around the notion that the organization has made such a strategic decision to go cloud or, at least, optimize their cloud and overall IT approach and move far more workloads to the cloud, including more mission-critical ones. Just like any other roadmap, a cloud roadmap is based on general best practices, tailored to the individual organization and starts with the end in mind: business goals. What do we have today (and is it really the best way we can organize it), where do we want to get, what are the goals we want to achieve, pain points we want to solve, requirements we have, factors that influence our business and users today and tomorrow, potential hurdles, gaps and so on. The cloud roadmap dives deeper into all of these and other questions and offers the strategic approach to get there. Obviously it’s not just about the business realities, drivers and goals but also about the more practical, tactical, measurement and technological aspects of moving to the cloud. Although each journey and roadmap is different there are quite some common elements in the stages of various cloud roadmaps. Finally, it’s not because an organization has a rather organic path towards more cloud as opposed to the more strategic ones, as we also tackled in the introduction, that the first can’t learn a thing or two from cloud roadmaps. Chance is high that you’ve heard about fog computing, a form of edge computing. Fog computing is a term that was coined by Cisco and essentially is an extension of cloud computing for so-called advanced distributed and connected systems. At the basis this mainly concerns the IoT (Internet of Things) but it also includes 5G and artificial intelligence. In specific circumstances existing cloud network approaches are not that well fit for many industrial IoT applications in areas, ranging from smart industry to smart buildings, smart cars and smart cities to smart, connected applications in, for instance oil and gas. An IoT network has several components, just like traditional networks, which all fulfil their role in the overall picture of data, communications, analysis, applications and so forth. The most basic level of such a network is that of connected objects, the ‘things’ in the Internet of Things which essentially gather data. This could be a connected machine, an oil rig equipped with sensors or an IoT device in a connected car. A traditional network and cloud model in such an IoT network would look a bit like this: the sensors ‘sense’ data and communicate them to other electronics and nearby devices where they would get stored for a specific time and then sent to the cloud (or a data center) for filtering, processing, analyzing and so on. If you want to know more in detail how it really works do take a look at our articles on respectively, the IoT stack and IoT gateways. In IoT deployments, for instance in oil and gas or ‘heavy industries’ there are loads of IoT data. This is increasingly also the case elsewhere as sensors become cheaper, IoT projects increase and there are ever more connected devices gathering tons and tons of data. We even speak about an IoT data deluge and it’s just the beginning. Now, not all gathered data is important for what we want to achieve with such deployments. And of the data that is important some is more important and time-sensitive. When you would send all this data to the cloud you would simply need a lot of bandwidth. And what do you do when there isn’t a cheap communication technology around, for instance in very remote places, and you have to use things like satellites for all that data? And what if the data is so important that you need it right away to take human or automated decisions but the communication is interrupted. It’s here that fog computing comes in as a complement to or form of extended cloud computing. Fog computing filters and analyzes data close to where they are generated in an IoT network: at the edge of it. This is done using fog nodes who, along with a fog IoT application, work to solve these and more problems. By way of an example: if some sensor captures any sort of data for which it was build (heat, fire, moisture, the presence of gases, change in position or speed, the list is endless) and that data means that there is something happening or about to happen (predictive analytics and predictive maintenance) in a very particular, sensitive and crucial environment (e.g. a gas pipeline, a petrochemical plant, a connected car and more) you want to intervene right away. So this type of data would really need priority handling, analyzing and action instead of having to wait until a bulk of data is sent to the cloud where all still needs to happen. There is more about it as you can read in our article on fog computing but do note that fog computing and cloud computing are essentially very closely related and go together in such networks. An example of this can be seen in the work of NIST on fog computing. Remember NIST’s service level models SaaS, PaaS and IaaS? Well, since fog computing is an extension of cloud they were simply taken over in fog. Same thing for the delivery model: where we have public, private, hybrid and community cloud the fog node deployment model comes with, exactly, public, private, hybrid and community fog node. Top image: Shutterstock – Copyright: rangizzz – All other images are the property of their respective mentioned owners.